Posted on April 4, 2017 - 02:08 PM by Nadine Caldwell P.A. Removing last year's unused clutter is therapeutic and necessary. However, knowing what should stay and what should go is often an overwhelming challenge. The following five tips are meant to help with the process of letting go. 1. Does It Get Used? A good rule of thumb when dealing with a stored or unused item is: if it hasn't been used in six months to a year, it's time to let it go. Storing an item that is never used takes up space from things you'll actually use. 2. Is It Outdated? While cleaning, take a close look at things like outdated electronics. If the technology is so out of date that accessories and media are no longer available, use spring cleaning as an opportunity to upgrade. The bonus is that newer electronics are usually smaller, and replacing old, bulky electronics helps create more space. 3. Is It a Duplicate? There are exceptions of course, but in most instances, duplicate items are perfect candidates for spring cleaning take-out. Sell a duplicate item or give it away. 4. Clear Out the Closets. It's easy to become attached to certain pieces of clothing and to let that attachment get out of hand. 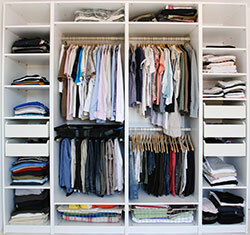 When cleaning out the closet, look closely with fresh eyes and eliminate unused or outdated clothing. 5. Remember the Pantry. An often forgotten aspect of spring cleaning is the pantry. Donate canned food or impulse buys that your family won't use to local homeless shelters or food banks. Cleaning out old food supplies is a good way to see what groceries are getting used and what items are going to waste—a good thing to know for future grocery shopping trips.